Welcome to TMS of Valdosta. We provide patients in South Georgia with the latest in depression treatments. 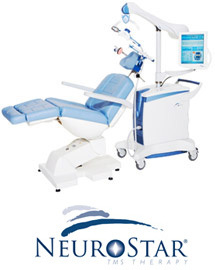 We are pleased to be able to offer Neurostar® TMS Therapy to our patients. Transcranial Magnetic Stimulation Therapy is one of the most technologically advanced depression treatments available. This non-invasive, outpatient therapy is FDA cleared and has helped thousands of depression patients who have not received adequate results from antidepressants. Transcranial Magnetic Stimulation, TMS Therapy, uses short pulses of magnetic fields to stimulate nerve cells in the one of the areas of the brain thought to control mood. TMS Therapy is a treatment that can be performed in a psychiatrist's office, under his or her supervision while you remain awake and alert, using a medical device called the NeuroStar TMS Therapy system. •Non-systemic, meaning that it is not taken by mouth and does not circulate in the blood stream throughout the body.